Arizona's Best Senior Placement Options was created to help you navigate through the aging process by connecting you with appropriate services. We have first-hand knowledge of each of the resources we recommend and believe strongly that those companies practice integrity and compassion. Only those companies we trust to care for your loved one will be given our Preferred Provider standing. Arizona’s Best Senior Placement Options is solely affiliated with top notch and highly reputable organizations so you can be confident in our referrals. Arizona's Best Senior Placement Options assists seniors by making the aging process a more enjoyable experience by reducing anxiety and eliminating the overwhelming task of finding appropriate senior housing. We strive to help make our clients relish their retirement years by understanding their clinical, social, financial, and geographical factors and integrating these key elements together to ensure that we advise them accurately. 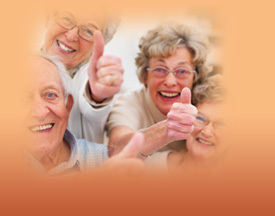 Arizona's Best Senior Placement Options Eldercare Specialists understand how to create valuable relationships with seniors because we have an extensive understanding of all of the key factors that are important to a senior's well being. When working with our seniors, we always do so by keeping their needs first. We are obligated to advise only in the very best interest of the senior. A ABSPO Eldercare Specialist's passion is realized when the connections they make provides seniors with the ability to maintain the highest quality of life possible. © 2010 Arizona's Best Senior Placement Options LLC All Rights Reserved.